President Barack Obama and Chinese President Xi Jinping stand at attention for the playing of each counties national anthem during an official state arrival ceremony for the Chinese president, Sept. 25, 2015. Talks expected to include alleged Chinese cyber spying, Beijing's economic practices and territorial disputes in South China Sea. The United States welcomed Chinese President Xi to the White House Friday with full honors, including a 21-gun salute, ahead of his talks with President Barack Obama, which are expected to focus on difficult issues such as China's alleged cyber intelligence gathering, Beijing's economic practices and its policy on territorial disputes in the South China Sea. President Xi, beaming, said relations between China and the United States are "at a new starting point," as he headed into the executive mansion with President Obama. The American president said, "Our two great nations — if we work together — have an unmatched ability to shape the course of the century ahead." 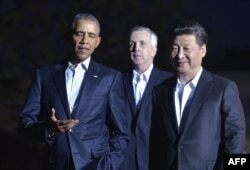 Obama took note of human rights concerns that have been a source of friction between Washington and Beijing. "Nations are more successful and the world makes more progress … when the universal human rights of all people are upheld," the U.S. president said. Xi arrived in Washington Thursday on the second leg of a week-long trip to the U.S. that began in Seattle, where the Chinese leader sought to reassure U.S. companies he is working to create a more favorable investment climate in his country. Later Thursday, President Obama hosted Xi at a private working dinner, where White House aides said they would begin grappling with the main issues that divide their countries. Though the talks will deal with a raft of uncomfortable topics, U.S. officials on Thursday highlighted an area of cooperation between the world's two largest countries: climate change. Xi on Friday will unveil a new cap and trade program meant to regulate China's worst-in-the-world emissions, according to U.S. officials, who spoke on condition of anonymity. During Obama's visit to Beijing last year, the two countries agreed to reduce climate change-causing greenhouse gas emissions, in what was seen as a landmark moment for the world's two worst polluters. Earlier, U.S. officials said cyber security is expected to be one of the main focal points in talks between the U.S. and Chinese presidents. On Wednesday, the U.S. Office of Personnel Management said a further investigation into the data breach reported earlier this year revealed that more than 5.5 million fingerprint records were stolen, five times as many as first thought. U.S. officials have not accused China of the breach. 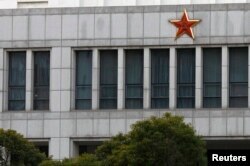 However, U.S. investigators have told reporters privately that they believe the Chinese government is responsible. U.S. business leaders are seeking personal assurances from President Xi that their companies will be treated fairly when they do business in China, and that Beijing will scale back its alleged large-scale cyber theft of commercial secrets that has cost American companies billions of dollars in recent years. “China and the United States have had a late and feeble start to consultations on what to do about managing the rules of cyberspace,” said Carnegie Endowment for International Peace analyst Douglas Paal in an Op-Ed for China Daily. Another area of disagreement expected to be discussed is China's controversial territorial claims in the South China Sea. Most pressing is China's island-building efforts in the Spratly Islands chain, parts of which are also claimed by the Philippines, Vietnam, Malaysia, Brunei and Taiwan. “We do not take positions on claims,” said Kirby. Earlier this week, Xi told The Wall Street Journal that the Spratly Islands have been Chinese territory since ancient times. VOA's William Gallo and Pam Dockins contributed to this report.